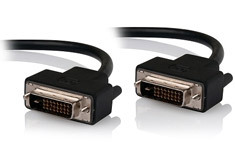 The Alogic Dual Link DVI-D digital video black adapter is designed for connecting a computer with a DVI enabled output or a DVI enabled video card to a display with a DVI input. The cable has 28 AWG copper conductors, which are individually insulated to minimize crosstalk, and ensure high-speed, error-free transmission. Backed by a lifetime Alogic warranty.